I’m very pleased with how they turned out! 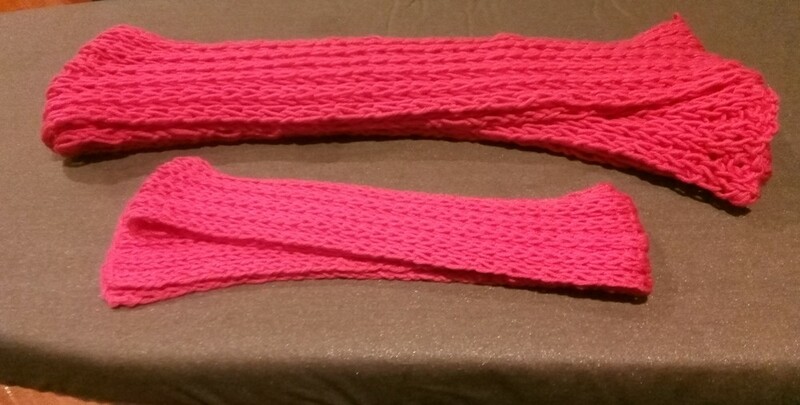 This photo makes them look like they’re different shades of pink, but that’s just the lighting; they’re the same yarn. Well, one is 4ply and the other 10ply, but you know what I mean. This is cotton, knitted on oversized needles for the ply, in a 2-2 rib. I’ve knitted a scarf for myself like this in the past and the result is a lovely “squishy” fabric. Also gets an almost scalloped edge going on the ends which is kind of nice. Not the warmest, true, but a nice bit of extra cover around the neck. I’m hoping my friend’s wife like’s them. Posted on October 17, 2018 Categories craftsTags knittingLeave a comment on Commission delivered! Oooh I remember this… it’s called knitting! I haven’t knitted since I became a weaver. So that’s what? Three years? Four? Not really a conscious thing, but weaving was intended as a knitting replacement so it makes sense. But it’s weird. I can cast on with my eyes closed. I can knit and purl with my eyes closed. Like, if you put needles and yarn in front of me I’m just going to start aknittin’ somet’ing. And it feels goooood. So, I’m knitting. With pink cotton. A matching mum and bub scarf set (of all things). Photos will follow. Posted on September 29, 2018 September 25, 2018 Categories Other projectsTags knittingLeave a comment on Oooh I remember this… it’s called knitting! 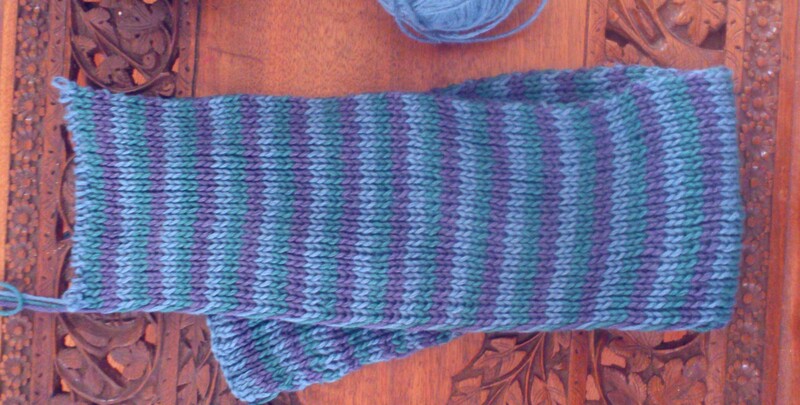 About four years ago, I decided to knit myself a striped cotton scarf. Carrying the three colours up the sides was a lot of fun and I was loving how it was coming together. Then I put it down one day and noticed it had developed a curve! Obviously this was something to do with carrying the colours and one side had developed a much tighter edge than the other. Incrementally this had caused my scarf to curve. Jump to a recent tidy up where I found the half unpicked project languishing in a bag. It was a sad sight. Three balls of unravelled scarf and a big tangle of yarn leading to the considerable amount yet to be unpicked. Unpicking three colours is not so much fun, but I’ve been quietly doing bits and I’m almost done now. Once finished I think I’m going to use those balls to warp my loom and see if I can’t do an enjoyably stripey scarf that way!! A few weeks back my mum was talking about making herself a sort of ‘knee-warmer’ to keep her problem knee warm and I suggested she might use some chunky yarn I unearthed recently. It seemed like a good idea because it’ll knit up fast and be warm. The funny thing was that she has many a set of needles, but none intended for 14ply. In contrast, when I went hunting through my needles I found no less than 5 sets! So some of my needles are on agistment at her place (well not really but I do love that word) while she designs her knee warmer. Why do I love the big yarns? Partly because they are quick to knit and that’s great for scarfs, but also they often have such a pluffy, lush texture. Now that I’m weaving they aren’t featuring as often, though I did put one on the loom recently. It was something like good-planning that could do this because, in anticipation of my continued love of large yarns, I got a large dent reed when I bought extras last year! Since I started in on the xmas presents at the end of last year, most of what I’ve woven have been fiddly things; 4 shaft patterns, double weave and loops. Then tablet/card weaving came into the picture and, while not fiddly as such, it has certainly given the brain some exercise! So, after reacquainting myself with my yarn stash, I decided it was time to do some good old plain weave. You know, I’d actually forgotten how fast you can weave a scarf? Before I knew it I was at the hemstitching point! It was also very relaxing and my mind happily drifted as I wove. Must make a note to myself to do a plain weave project in between double weave etc, so I can relax and enjoy the weaving. Not that double weave etc were too stressful, but you have to pay so much attention to what you’re doing. This was like knitting garter stitch (I’m sure you knitters know what I mean)! The funny thing about this project was that it took me as long to finish as to weave. That was because I added some of that fringe-like, fluffy yarn that was all the rage a few years back for knitters and it took forever to free the fringe-like bits from the web. Still, it looks pretty much how I hoped it would. Now I just need to give it a bath. And I’m going to predict that the next project will be plain weave too.